“These scissors don’t work, can you pass me yours? Thanks. Hmm… these don’t work either. Did they work for you? They did?! How did you get them to work!” It is quite embarrassing to be the only kid in class who doesn’t know how to use scissors. Although it was odd that these scissors didn’t work because my scissors at home work just fine. My Sunday School teacher eventually found the problem–I was left-handed! That was 30 years ago. My experience with pens was similar. At the end of a writing session I’d have ink smudges all over my writing and ink all over my palm. I compensated by writing with a hooked hand. 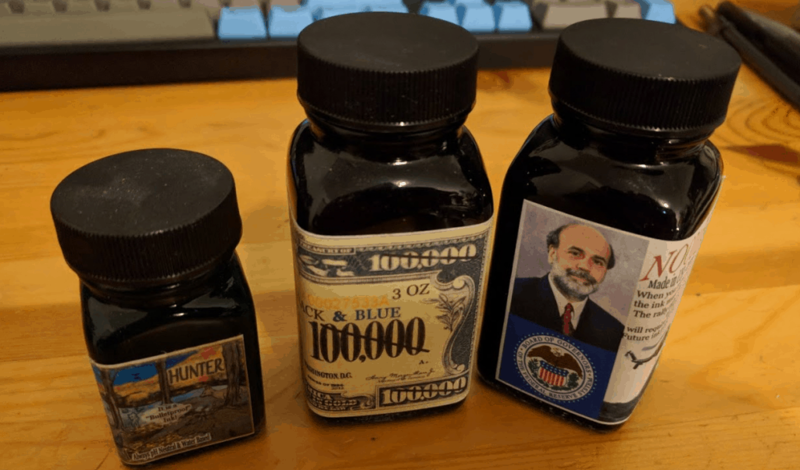 Last year, I discovered the Fountain Pen and Noodler’s Bernanke Ink (an homage to Ben Bernanke who needed fast drying ink to print all that money). The ink in most cases dries before my palm gets there. I left ballpoint pens behind and have not looked back. Fountain pens have a few advantages over ballpoints. The pens last forever and the ink is refillable without the need for disposable cartridges which is more economical in the long run. There are a variety of inks to choose from and they all have different properties. Some are waterproof, archival quality, forgery resistant, dry fast, don’t freeze, etc. But the advantage I like the most is how little effort it takes to write with a fountain pen! It has been said that the ballpoint pen killed cursive. On a ballpoint for ink to flow the pen has to constantly move to roll the ball, and in order to do that you must exert pressure. The trick is you need enough force to roll the ball, but not so much you punch a hole through the paper. With a fountain pen the weight of the pen is enough pressure for ink to flow. It took me awhile to train myself not to apply force. This changed how I write. 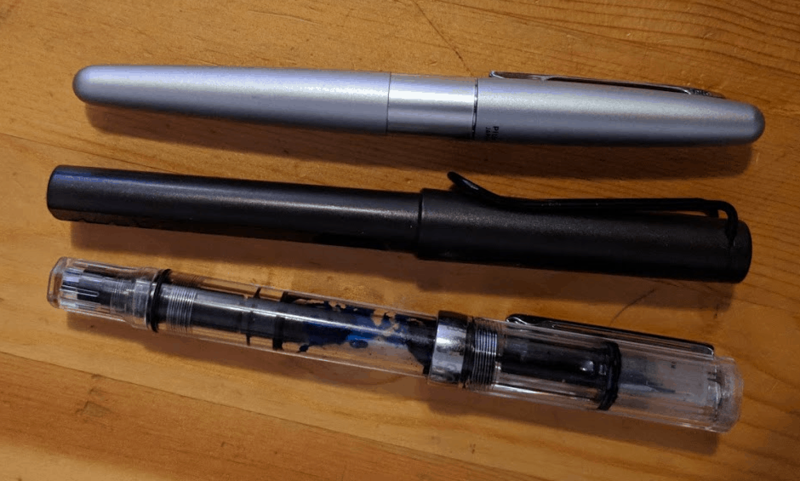 Some fountain pens are extremely expensive, I don’t really see the value in those… but here are three affordable pens, all under $30 that write great. The Pilot Metropolitan is the least expensive and the first pen I bought. It includes one disposable black ink cartridge and a converter (a converter is used to “convert” the pen to be able to use ink straight from an ink bottle) pictured below. In this case squeeze the tweezer things, dip the end of the ink converter into a jar of ink, release the tweezers and it will draw up ink. Insert that into the feeder and it’s good to write. This is the only pen I have that comes with a Japanese nib which tend to run finer than German or Italian nibs. I got a fine and it is the finest so far, even more so than Lamy Safari’s extra-fine. The Pilot can also be purchased with an extra-fine which would be finer than anything I’d want. The 2nd Pen I bought was a Lamy Safari. I like this pen because it has a nice matte plastic texture and it’s one of the least flashy fountain pens one can get (if you get black that is). It’s plain and simple. Even the nib is black which is unusual. One nice feature is a window on the side lets you know the ink level. The Lamy comes with one disposable ink cartridge, but does not come with a Piston Converter so I had to get that separately which adds to the price slightly. The converter is simple, insert it into a bottle of ink, twist the knob at the end to drive the piston up along with the ink. The TWSBI Eco is the last pen I purchased. It is my favorite so far being the only piston filler pen which means it doesn’t need cartridges or converters. Refilling is as simple as placing the pen in a bottle of ink, and twisting the cap to drive the piston creating a vacuum to pull in the ink. This pen also has more capacity in the ink chamber than any of the other options resulting in fewer refils. Obviously since it’s transparent this is also the easiest pen to see how much ink is left. 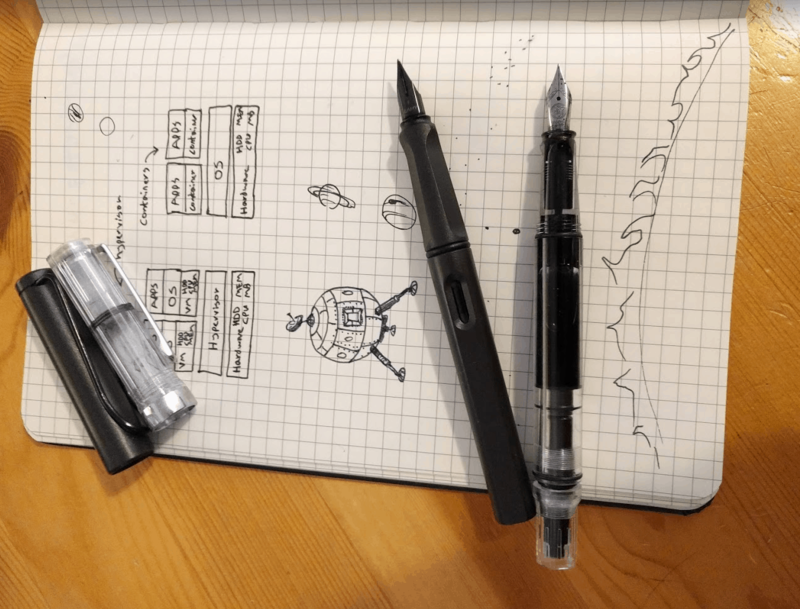 The pen is very economical, by far the simplest and least expensive piston pen on the market and doesn’t seem to sacrifice any quality. The only ink I’ve tried is Noodler’s and I don’t really have a reason to try anything else. So far it’s worked great in all three pens. I usually write with Noodler’s Bernanke Blue or Black which both dry fast and are my favorite inks. But the Bernanke inks do feather on cheaper paper so I keep one pen filled with Noodler’s Heart of Darkness which seems to be a nice compromise between anti-feather and fast drying. 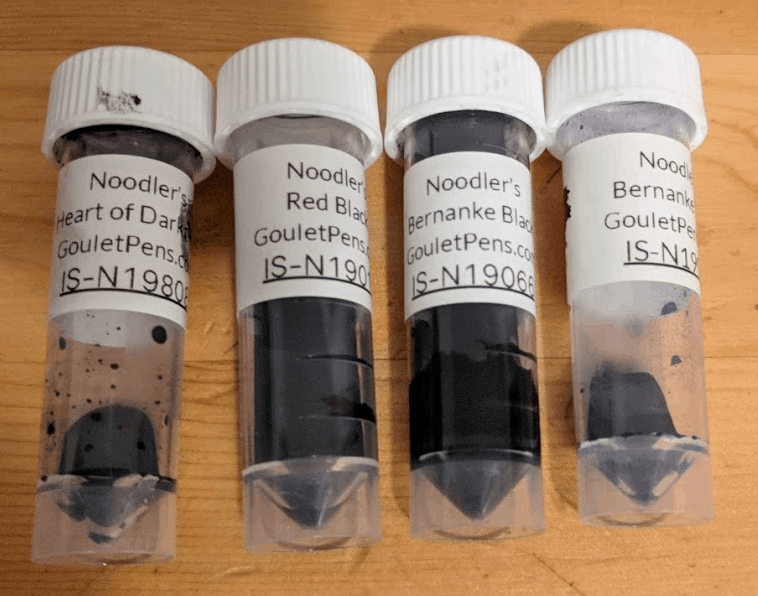 Before buying a whole bottle of ink, GouletPen’s sells ink samples, I started with those to find which inks I like best and how it works on the paper I typically write on. Jet Pen’s Fast Drying Fountain Pen Inks guide is great if you’re looking for fast drying ink… expand each color to see pictures of how it stands up to smearing after 3, 10, and 20 seconds. So far I have not lost any pens which is good. After about a year the maintenance on them has been minimal. About all I do is refill them. I once let the Pilot sit for several months so it didn’t start, to get it going again I ran water over the nib and it was good to go. The few times I pick up a ballpoint I notice… it doesn’t effortlessly glide across paper like a fountain pen. The ink (even Bernanke) doesn’t always dry faster than a ballpoint (depends on the paper), but the angle I write with is shallower so I don’t smudge as much–with a ballpoint I have to write at an almost vertical angle. I don’t think I’ll be going back anytime soon. Despite all that some habits are hard to break: I still write with a hook. This post is licensed under the CC BY 4.0 license.